It’s officially soup weather here in California. America is in the thick of February, the coldest weeks of winter, and no matter how hard I try I can’t seem to stay warm. I have a little space heater under my desk; it’s constantly on “high” blowing warm air directly onto my sock feet. I sip tea all day long and snuggle inside my sweater, dreaming about that Mediterranean vacation I took with my husband several summers ago. Back in November, I was excited to welcome back the cold. I looked forward to the rain, the clouds, and that brief (and relatively mild) change of season we experience here in Southern California. But never mind that. I’m ready for spring… it can’t get here fast enough! 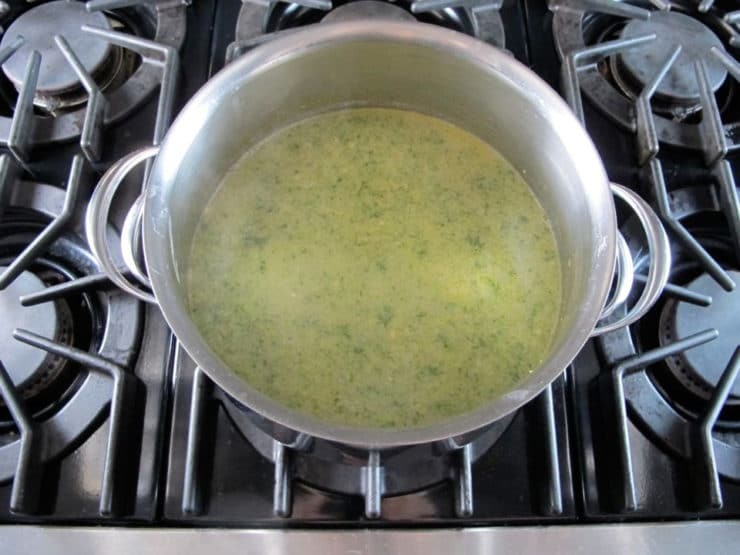 Broccoli soup, thickened with potatoes. Tahini?? The idea may have occurred to me after making a batch of my Autumn Sweet Potato Soup, which is enhanced by peanut butter. If peanut butter can add richness and creaminess to soup, why not tahini (which is essentially sesame butter, or paste)? I decided to play around using up some ingredients I had in the fridge… broccoli, onion, garlic, a parsnip, some fresh dill. After spicing it just so, I served a bowl to my husband. I didn’t expect to nail it on the first try, but he was thrilled. After two bowlfuls, he declared it one of his new favorites. I like it too. We’re trying to work more vegetables into our winter diet, and this soup is a perfect way to get our healthy cruciferous greens. It’s vegan, gluten free, and dairy free, yet also creamy and filling. The soup is rich in protein and calcium thanks to the tahini paste. It’s health food that doesn’t really taste like health food. I’m sure I’ll be making this one a few more times before soup season comes to a close. This healthy vegan broccoli soup is blended with tahini paste and potato, fresh dill and spices for a creamy texture and no dairy. Kosher. Heat the olive oil in a large pot over medium. Add the minced onion and saute for about 10 minutes, till softened. 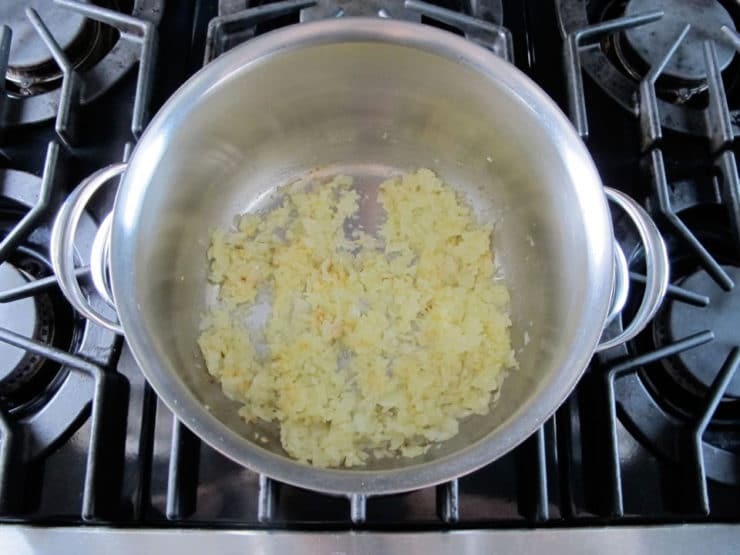 Add the garlic and saute for another 2 minutes till fragrant. 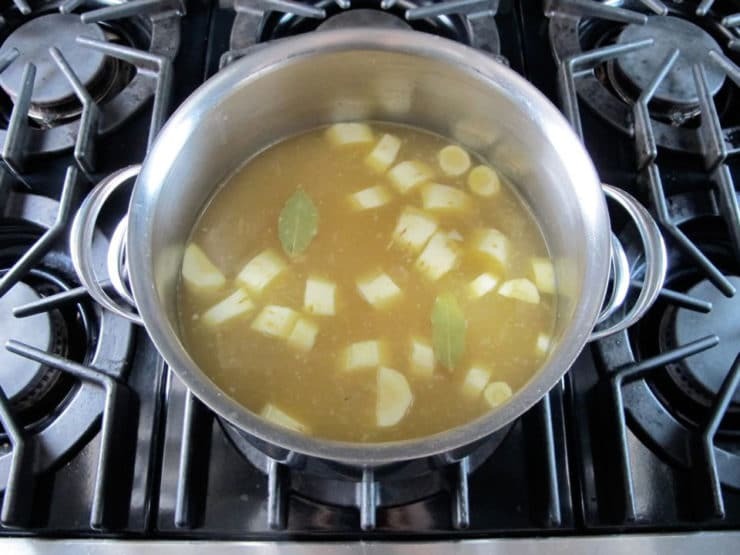 Stir in the diced russet potatoes, parsnip, and bay leaves. Cover the ingredients with vegetable broth, stir, and bring to a boil. Let the ingredients simmer for about 20 minutes till the potatoes and parsnips are soft. 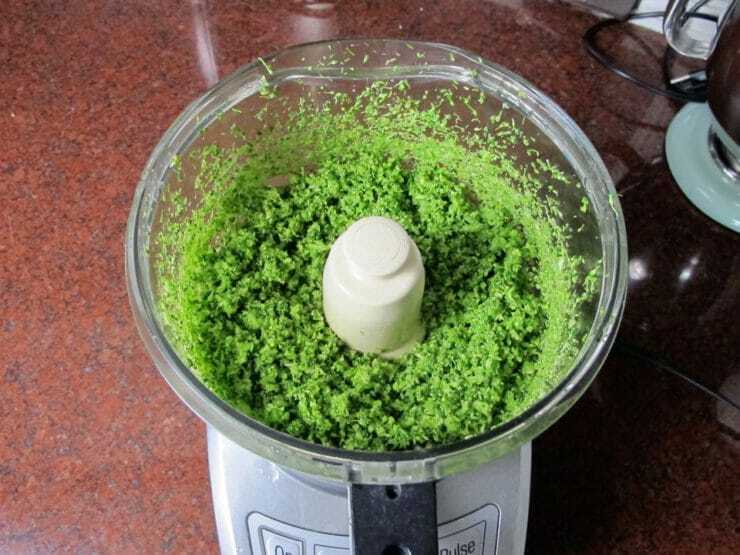 Meanwhile, remove the broccoli florets from their stems (you should end up with about 1 lb of florets) and place them into a food processor. Pulse till the florets have been chopped into tiny pieces. If you have a smaller food processor, you may have to do this in batches. You can also chop the broccoli by hand, but make sure it is chopped very fine-- this will speed cooking time, ensuring that the broccoli stays green and retains its vitamins. When the potatoes and parsnip have softened, remove the bay leaves. Add the chopped broccoli florets to the soup along with the chopped dill, cumin, cinnamon, cayenne and cardamom. If you're sensitive to spice, add the cayenne with care-- it's spicy! Using 1/4 tsp as the recipe suggests will give it a slight kick, which I really like. Bring the soup back to a simmer for about 5 minutes till the broccoli has softened. While the broccoli cooks, season with salt and pepper to taste. I use about 3/4 tsp of salt and a dash of pepper, more or less, depending on how salty my vegetable broth is. As soon as the broccoli softens, remove from heat. Stir in 1/2 cup tahini paste till smooth. Use an immersion blender to blend the soup till it's pureed and creamy. Serve hot. Garnish each bowl with a small sprig of fresh dill, if desired. Notes: for a slightly thinner, more appetizer-like soup texture, reduce 1 1/2 lbs of potatoes to 1 lb of potatoes. If you aren't worried about keeping the soup vegan, you can use chicken broth in the place of vegetable broth. For those who don't have an issue with gluten, I highly recommend serving the soup in a sourdough bowl, or stirring in a few toasted sourdough pieces to soak up the soup. Delish! Hi, I love broccoli and tahini – but potatoes and parsnips not so much – any tips for substitutions? I saw carrots might work for parsnips – ideas for potatoes? Thanks! You can try subbing turnips for the potatoes. This soup is tasty and satisfying. I had lots of broccoli, potatoes and tahini on hand so I made the recipe. 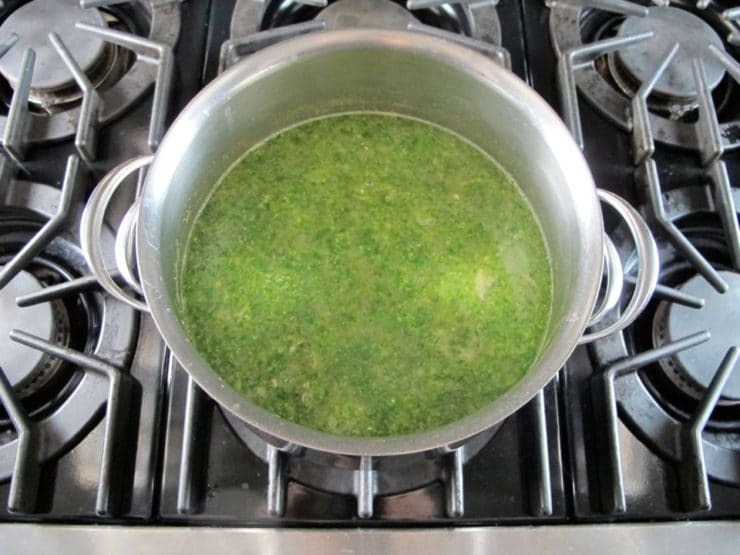 It was delicious and even my broccoli-hating husband said it was the best broccoli soup he had ever had….Wow! I did use chicken broth and had to leave out the cinnamon, still good. Thanks for a great recipe. Made this tonight for dinner. Overall a very easy dish to prepare. I made it with vegetable broth, which was very dark. Next time I may use chicken broth for aesthetics. I doubled the cayenne because we like a little more spice. It was very tasty, and I will make again. Next time, I may add a squeeze of lemon or lime to my bowl. Thanks for a great recipe! Hi Tori! I have made quite a few of your dishes! One of our favorites is the smoked paprika chicken thighs….and your hamentaschen! I find it frustrating when people rate recipes they haven’t tried. Judging from beautiful picturs is a bad idea. I cannot tell you how many beautifully photographed dinners have been just awful- not from your blog! Although the sirracha salmon patties were too much work for my family to not like. I keep trying to like salmon.? This soups sounds good, I am preparing my grocery list right now so that I can make it this week. Leave the votes for those who actually made it. I need a realistic assessment before trying to feed 8 -it’s double everythang! Can I use dry dill? I know it won’t taste the same, but would this sub still work? Hi Juanita, try subbing 1 tablespoon of dried dill. Add more to taste for a stronger dill flavor, if desired. Just wondering whether this recipe will freeze well – your thoughts? Hi Amy, I’ve never frozen this! I don’t see why it wouldn’t work, but it has tahini and I’m not exactly sure how it will freeze… if you try it will you please report back and let us know how it was? I’m excited to make this soup for a dinner party tomorrow night. Is it OK to make it tonight and reheas before serving? Hi Katherine! Sorry I didn’t get back to you right away, I had over 100 comments in moderation to sift through and answer this weekend. Did you end up making it ahead? I have never made this particular soup in advance but I think it would work, I’d be curious to hear how it went for you. Let me know if you have a chance! This is an excellent recipe! I didn’t blend it and it still turned out great. Thanks! system. Do you have the online “feature” which enables your Imperial quantities to be converted to Metric – Degrees Centigrade,milliletres, kilograms etc? If not (yet),would you consider building it into your site in the future? Keep up the good (invaluable) work!!! Update 1/23/18: this feature has been added, use the recipe card features above to access metric measurements as needed. 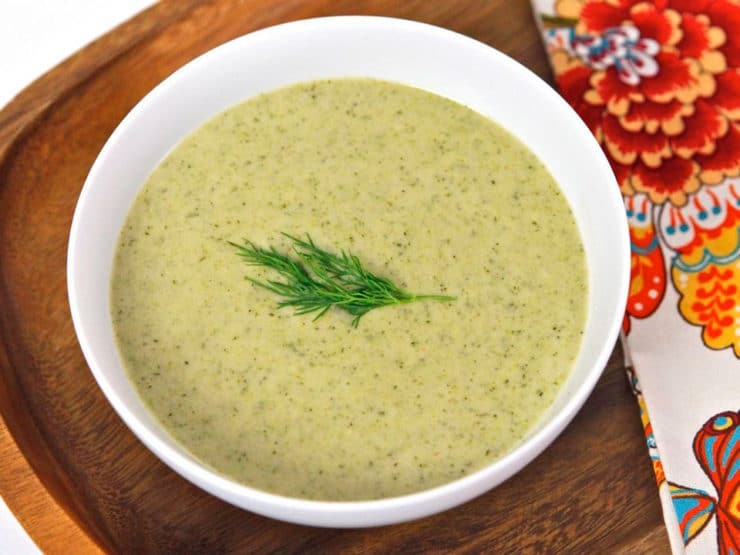 Creamy broccoli tahini soup sounds amazing! I’ve never tried adding tahini to a soup but it looks delicious. Great idea! I LOVE this soup! So easy and delicious. Thank you. Wow just made this, was looking forward to trying your Honey Garlic Chicken, but alas I forgot to defrost the chicken and all I had in the fridge to cook was broccili, cauliflower & zucchini so I threw all of them in the soup, was afraid to add the tahini 😉 but it was wonderful!! It’s great for people who can’t eat dairy to enjoy a creamy soup. Thanks! Delicious – made it for Friday night and asked my guests (parents and brother whom I know love tahini) to guess what’s the secret ingredient. My mother guessed immediately and we all loved it. Substituted 4 zucchinis for the potatoes. Thanks for another great recipe! I look forward to trying this one. Never thought to add tahini to soup. And never thought to chop the broccoli before cooking! Wait…what did you do with the broccoli stems? I always peel them and serve them to my husband, he LOVES them with a little salt and lemon juice. 🙂 But I suppose you could throw them in there, too… it shouldn’t hurt, as long as they have time to soften up. I would discard any really thick or tough stems. Chopping the stems up in the processor should make the cooking process go much faster! Great! more tahini recipes, please! How about a chocolate tahini cake like they have in Israel?? Kol haKavod. Wonderful reading. I am allergic to all cruciferous vegies. No I can not eat cooked broccoli. Is there a substitute you can recommend. I would certainly try tahini soup. Thanks for your assistance. Just finished making this beautiful soup. It is so yummy! Great flavors. Thank you for this post. Tahini in soup is a brilliant idea. I’m stealing it. what about a turnip instead of the parsnip? or cauliflower? as for tahini, it does seem to be the glue of this recipe, but i could see the soup tasting good without it, just different. soaked and blended cashews might work. I eat soup almost every day for lunch at work, and beautiful broccoli is all over the farmers’ market right now. This soup looks delicious, can’t wait to try it. This looks wonderful! If I leave out the olive oil it will fit into my new way of eating! Hooray! !